One of the worst hot-takes I read on the Internet last year was not on Huff Po or a high school acquaintance’s Facebook wall. It came from Electric Literature, a nonprofit online journal that I generally enjoy reading. In “Dirty Life and Times: The Past, Present, and Future of Working Class Literature,” author Adam Petty argued that while conversations about representation of LGBTQ folks and people of color are brisk and ongoing, nobody wanted to talk/read/write about the working-class. After quoting some shaky analyses about why this might be, he implored a return to the so-called “dirty realism” of authors like Raymond Carver. He glorified the genre like New York literati and English professors glorified it at the time: as exciting squalor for tourists that wanted to slum it in flyover country. John Darnielle, author of Wolf in White Van (2014) and front man of the band Mountain Goats, has made a life and an artistic career out of articulating the kind of “dirty realism” that Petty exalts. His lyrics for the Mountain Goats examine addiction, love, heartbreak, travel, or describe scenes of quiet devastation or life-altering choices; a dirty reality that’s intimate and immediate. His work wields its earnestness like a blunt weapon. 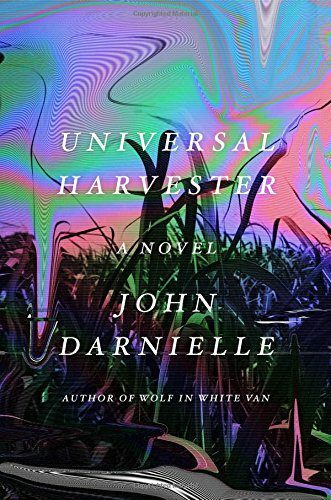 His second novel, Universal Harvester, examines the kind of working-class white characters that Petty proclaims are missing in American literature: inscrutable, deeply Midwestern men and women, not given to unnecessary words or conversations. “He didn’t like to start talking before he knew what he meant to say,” the narrator says of one character, but the phrase could apply to any of them (p. 93). Jeremy Heldt works at the Video Hut in Nevada, a small town in the Iowa cornbelt. One evening, a local teacher comes in to complain about the video she rented; a scene from some other film has been spliced into it. Not a recognizable film, though, nothing from Hollywood. These scenes all take place out on a farm that feels almost-but-not-quite recognizable, and show strange acts: a woman with a burlap hood over her face stands on a single leg; an unknown number of bodies thrash under a canvas tarp as someone in workboots kicks at them; a woman, lit by farm floodlights, flees from the camera and into the night. The clips are alarming, disturbing, but not criminal. They speak to some deeper strain of wrongness. Misplaced secrets are a mainstay of Gothic stories, and Universal Harvester is, to its core, a Midwestern Gothic. Its small-town setting amidst a rural backdrop is in a state of transition, where the fields of corn are now encroached by a building boom that is seeing pre-fab box stores eating up acres of former farming territory. The story spans that nebulous post-Internet, pre-Netflix period of time, when local video stores feared the spread of Blockbuster because nobody had even considered “streaming services.” The characters are similarly in flux, a fact that Darnielle dwells on at the beginning of the novel, and returns to at the end. Jeremy is twenty-two when the novel opens, living at home with his widowed father, and working a job that doesn’t offer him much beyond a comforting routine. Measuring this story against other stories is another recurring motif throughout the novel. Jeremy and the other characters find themselves wrapped up in a mystery that begs for comparison to movies that they hold in esteem. The narrator alludes to narrative possibilities that never come to fruition for the characters. It’s a way of acknowledging the audience’s expectations while still defying them. This is not the story you ever think it’s going to be, and that might frustrate readers who think they’ve been sold a horror novel. Horror, for me, is a genre of confrontation; Universal Harvester shies away and dissembles from such forthrightness. After discovering the odd scenes on the tapes, Jeremy finds himself drawn in, somewhat unwillingly, to their strangeness. He and the teacher, Stephanie Parsons, discuss what to do. She wants to investigate, to solve the mystery, to find the farmhouse in the frames. Jeremy, quite firmly, wants nothing to do with any of it, though he does settle for telling his boss, Sarah Jane, who owns the Video Hut. Sarah Jane actually recognizes the farmhouse that’s fleetingly glimpsed in the clips, and tracks it down. The current inhabitant, Lisa, is in fact the person who’s been splicing in these scenes, and though her motivations for doing so become clearer, the story itself is left unresolved, fading into a gentle static. Throughout all of Darnielle’s work runs a sympathy for and an interrogation of these characters and the environments in which they exist, introspection of a sort that Carver didn’t reach for and the coastal cultural centers rarely bother with. There’s no romance in Darnielle’s Iowa, no gratuitous grittiness. The traumas of the story are subsumed under the characters’ stoicism, but their relationships can’t bear the weight, and, inevitably tragically collapse. The narrative, however, doesn’t stick around to see the fallout. The audience is denied a catharsis, just as the characters are. Petty’s handwringing hot-take preceded, by several months, an entire plague of op-eds that sought to understand how and why the white working class had elected Donald Trump. How had this mythical salt of the earth been so betrayed that they would vote against their own interests? (Answer: it wasn’t just them, but droves of middle- and upper-class white people, but I digress.) There’s been no easy answer. Sometimes, things are broken, and they remain that way. Sometimes, there isn’t an escape; you just learn to exist in the damage until you can move on from it. Grief and loneliness run thick and fast through Universal Harvester. Many of the characters mourn someone or something: a wife in a car accident, a mother who retreated into a Christian cult, or a simplicity that seems to have retreated from modern life. There’s no supernatural in this story, just a peeling back of all the glamours of humanity and a record of what is found there. But even as the record is created, the formats shift, and the medium on which they’re written become obsolete. There are few revelations to be had, except perhaps this one: “If you learn to look hard enough, you can find stories in seemingly impenetrable tableaus. Street scenes. Parking lots. People waiting for a bus” (p. 290). Nino Cipri is a queer and genderqueer writer living in Chicago, and a graduate of the 2014 Clarion Writers’ Workshop. Nino's writing has appeared or is forthcoming in Tor.com , Fireside Fiction , Betwixt , Daily Science Fiction , The Journal of Unlikely Entomology , In the Fray , Autostraddle , and Gozamos . One time, an angry person called Nino a verbal terrorist, which has since made a great T-shirt slogan.